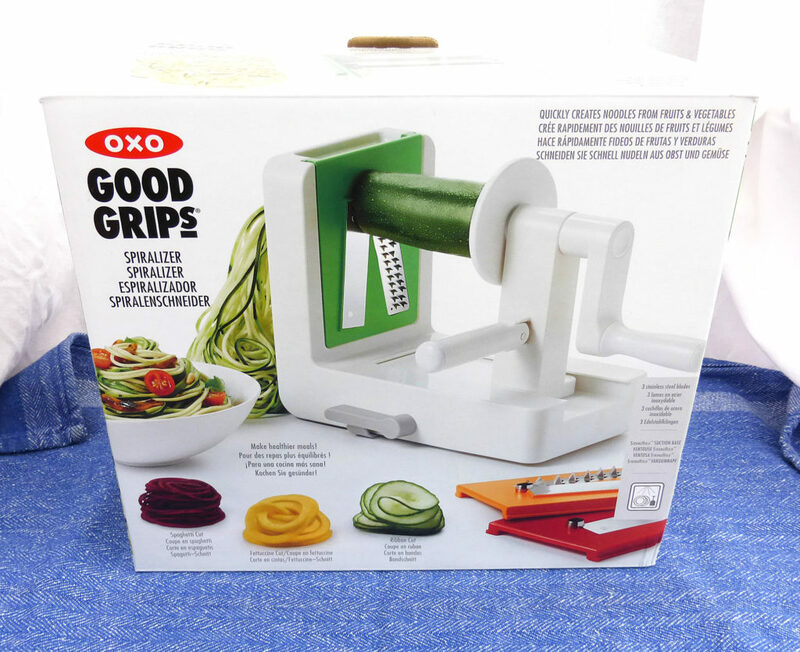 Anyway, without further ado, let’s have a look at my OXO spiralizer review. The first thing which struck me when opening my box, was just how pretty it was. 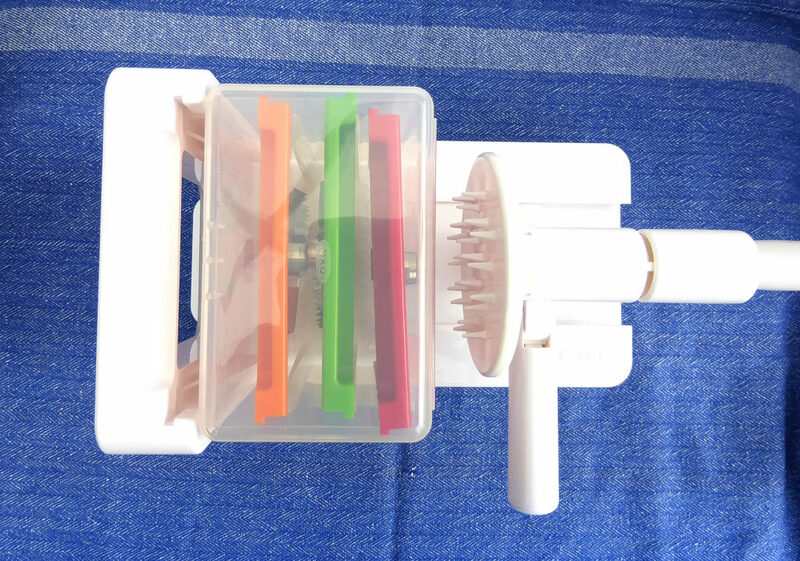 Rather than bog-standard white for everything, OXO have made their blades three different colours (red, orange and green), which look visually impressive against the glossy bright-white of the other components. The spiralizer needs putting together before using but we’re not talking frustrating IKEA flatpacks here. The assembly took seconds and was straightforward and intuitive. One thing I really like about OXO is that everything is made to be simple. A great deal of thought has gone into ease of use – life is complicated enough without making it rocket science to prepare a meal, and OXO get that. 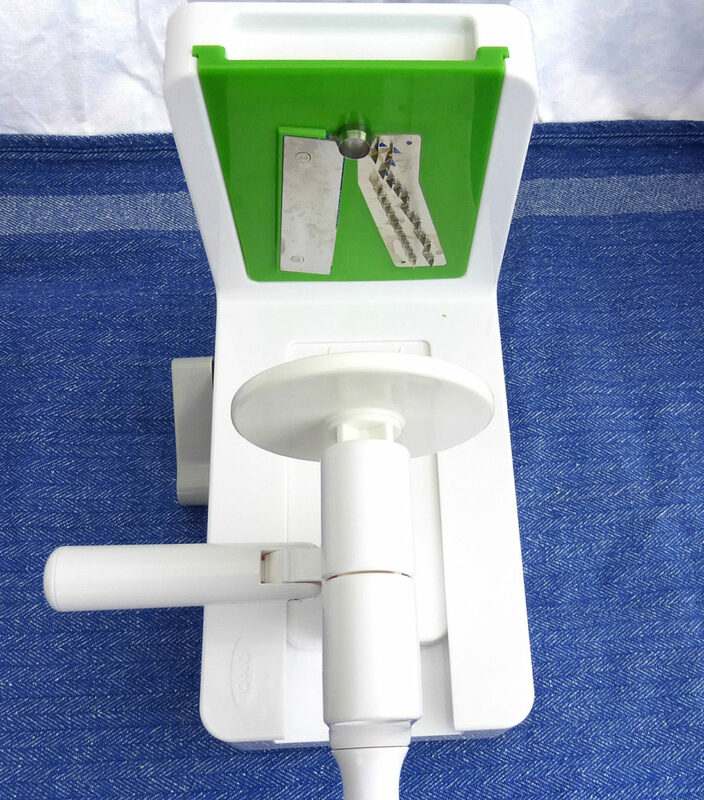 The spiralizer itself consists of a main body which has a moving, adjustable platform that runs back and forth along it. One side of the food is pushed against a gripping device with teeth a shark would be envious of (take a look at those babies above), holding it in place, then the adjustable platform is moved so that the other side of the food is pressed against the blade. A suction pad on the base of the appliance allows it to grip to the work surface, operated by a lever on the side of the main body. There’s also a handle at the far end which rotates the food against the blade, resulting in beautiful spirals. There are three blades which execute different cuts – thin “spaghetti” (1/8″), a thicker “fettucine”(1/4”), and a ribbon cut. This means that there is a world of choice with what to do with your food. 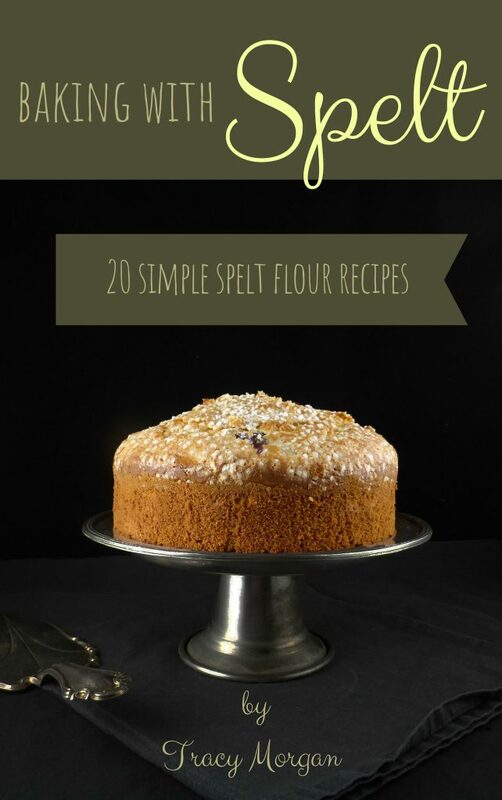 Transform boring veggies into pretty spirals, pep up stir fries, revamp potatoes, or make gorgeous decorative garnishes for your sweet or savoury dishes. 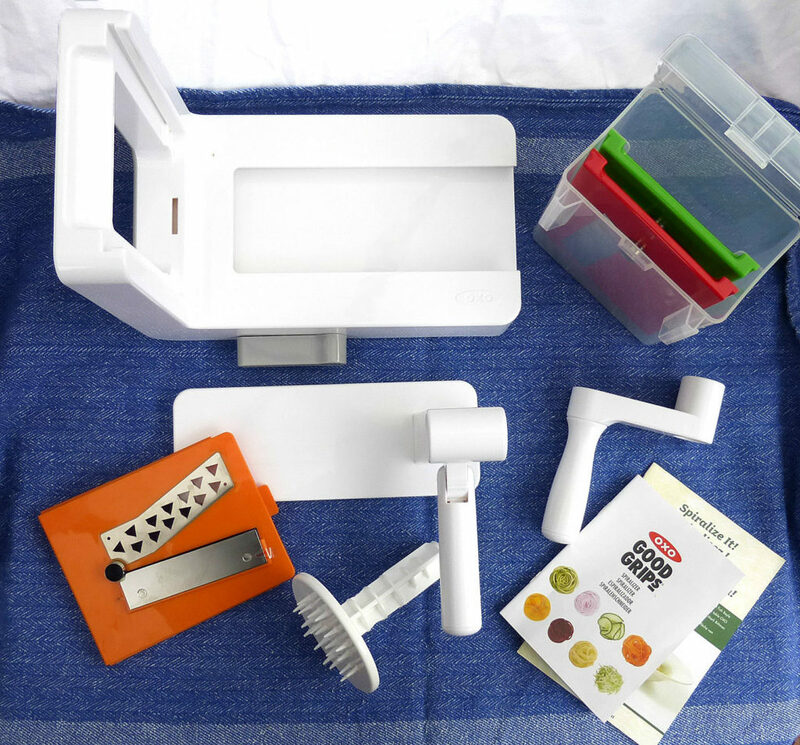 The blades are really sharp and it’s therefore no surprise that OXO have designed a sturdy case for them which conveniently stands on top of the spiralizer when not in use, keeping them safe and clean. 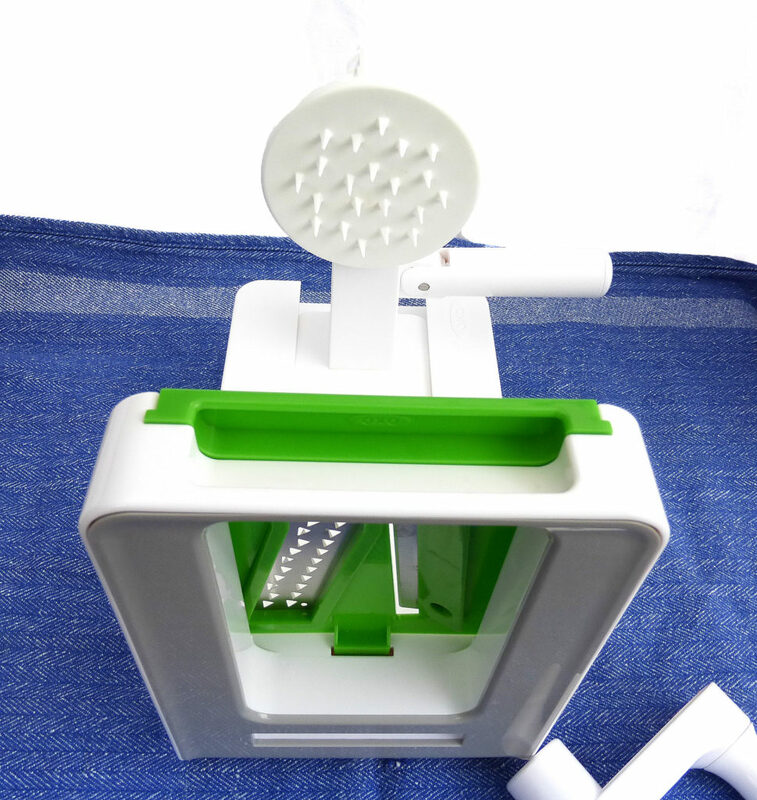 The blades slot in and out of the appliance with ease and can be popped into the dishwasher after use. Recommended foods for the spiralizer? The suggested foods for using with the spiralizer include cucumber, cabbage, carrots, zucchinis and squash, and while I think that harder fruit and vegetables may work better and produce a firmer spiral, I think that it is absolutely trial and error to see what works. 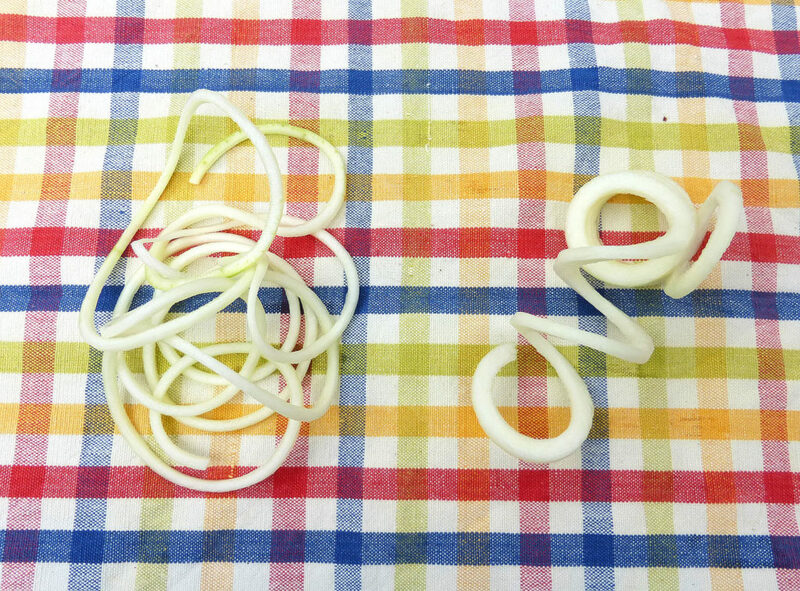 As the spiralizer is mostly associated with zoodles (and something I was particularly interested in), I was keen to see the difference between the spaghetti and fettucine cuts. 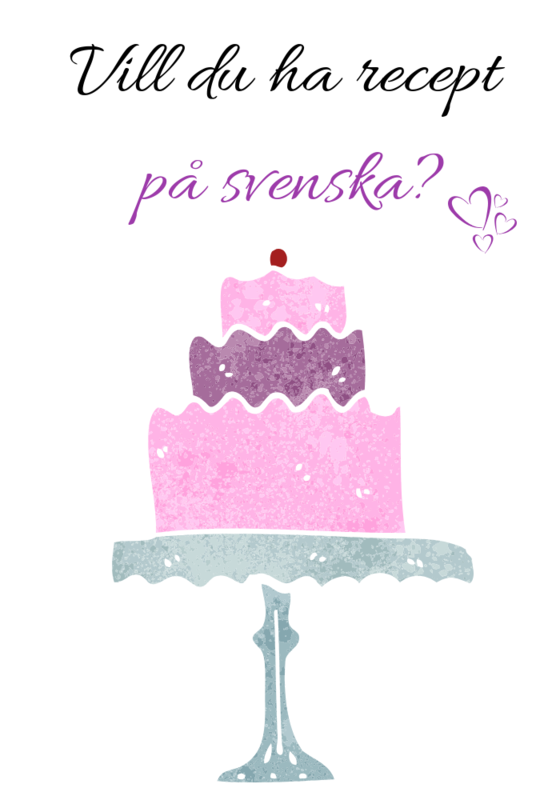 As you can see from the picture below, the distinction is quite pronounced. I love the huge spiral of the larger cut, and use it in stir-fries, while the thinner, more delicate spirals I’ve used as a replacement for spaghetti in several dishes. I love chips (fries) and usually make them in my Actifry. But plain strips get old, so thought I would try my hand at curly fries. 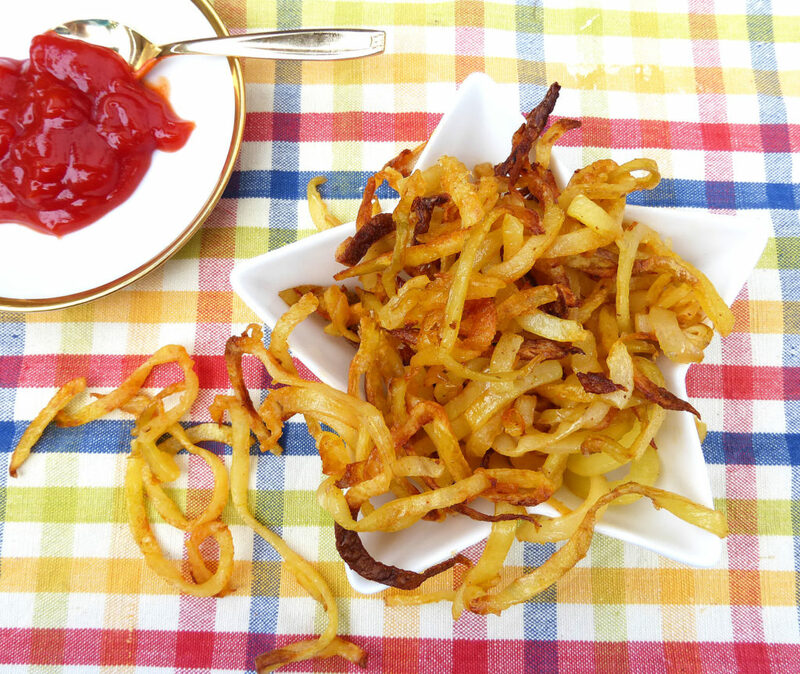 These were easy to make: spiralize a few large potatoes, throw them in a fairly large baking pan, drizzle with oil, salt, pepper and a little paprika, and bake them on quite a high heat (220°C). There you have it! Next time I am going to see how well they fare in my Actifry! 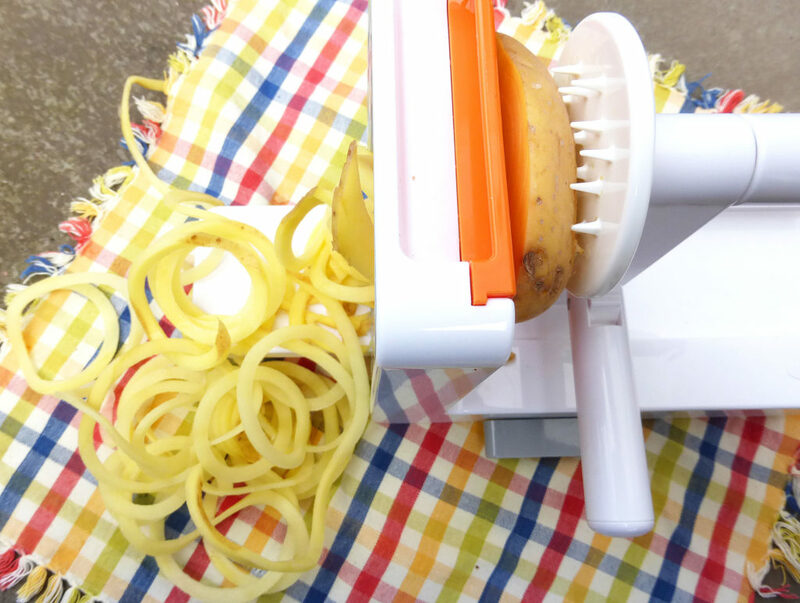 I’ve also used the spiralizer to slice vegetables really thinly. 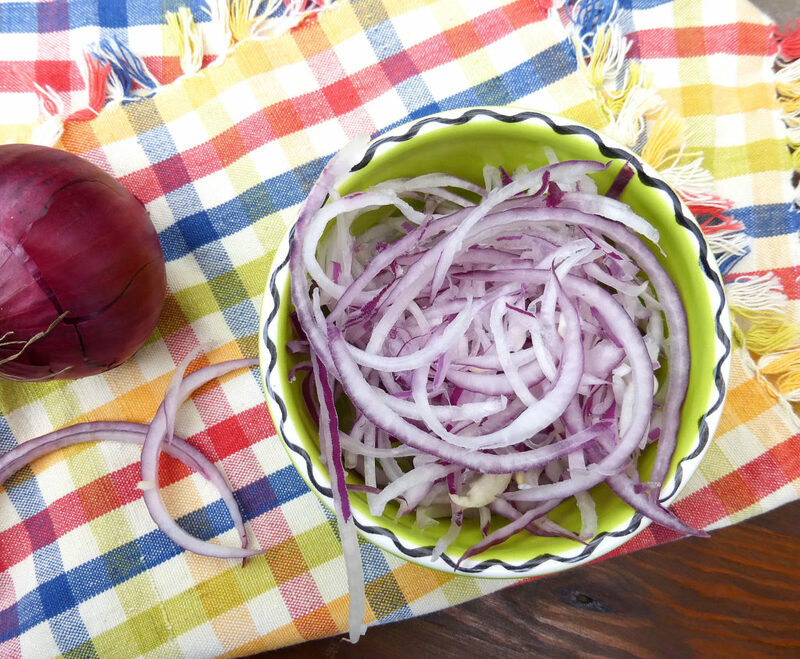 Admittedly, some don’t hold their spiral shape too well, but still produce a fine, thin cut which is perfect for things like onions, which I love raw on salads but don’t like too thick. 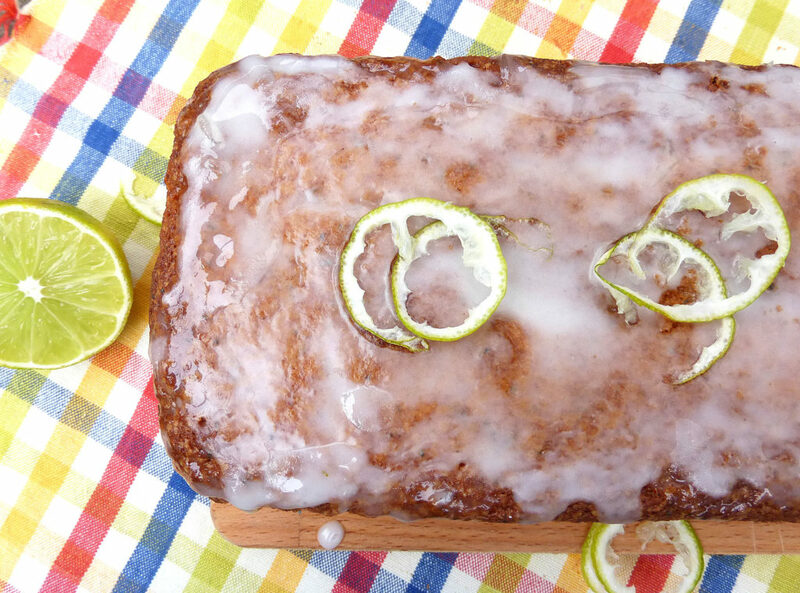 Lastly, I’ve created delicate little spirals with limes which I used to garnish a lime and poppy cake (look out for the recipe coming soon). 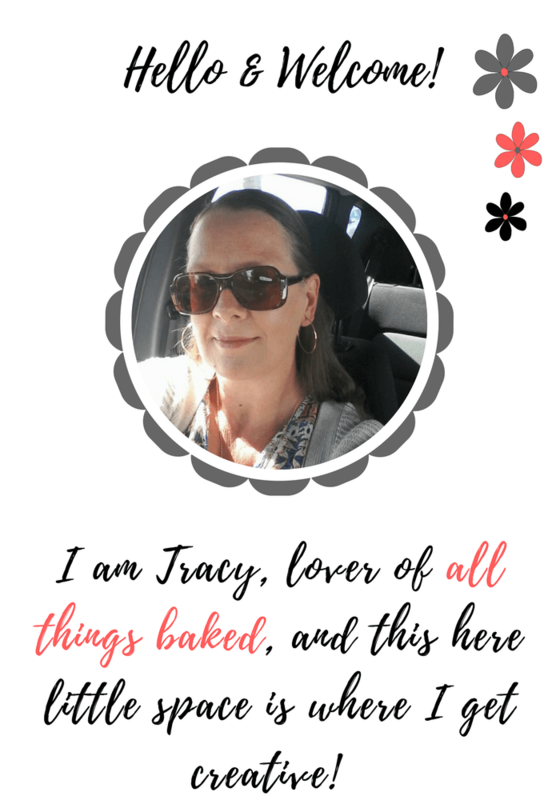 Here’s a recap of the spiralizer’s glowing positive points and a look at some of the more negative aspects I personally found. It looks gorgeous. Sleek, glossy and very modern. 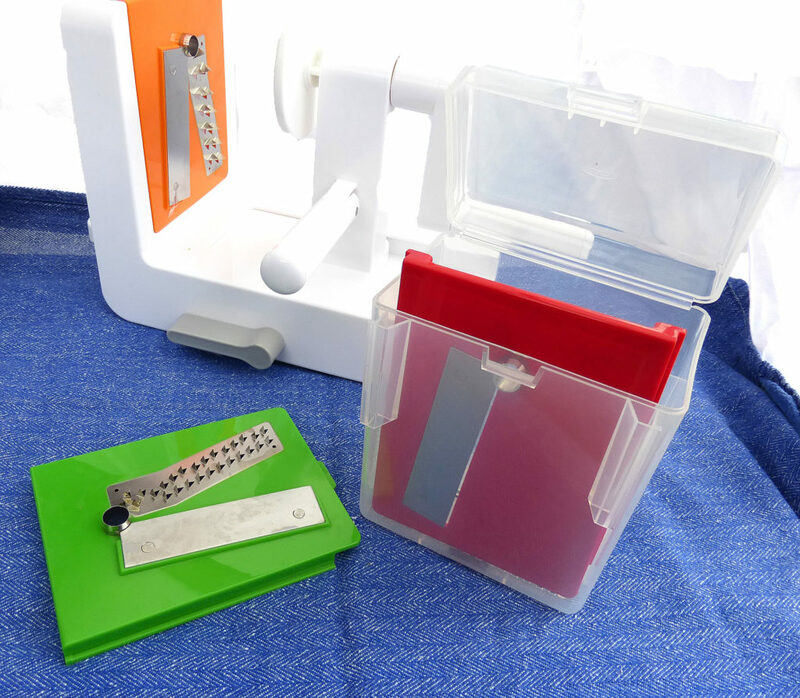 The developers have thought carefully about ease of use, such as the protective blade holder and quick assembly. It is intuitive, easy to take care of and the fact that it’s dishwasher safe means that there is no laborious clean up. It provides a healthy option to pasta, as well as cutting, slicing and spiralizing a whole host of vegetables and fruit in a new way. It is advertised as being very steady on a work surface (there is even a special lever to hold things in place). However, I found that it did still wobble around and I really had to press down tight to keep it still when spiralizing. You need a straight edge on both sides of the food for the teeth and blade to get a firm hold, which means that you need to cut and shape the food, resulting in a little waste. I also had problems with certain things attaching, such as carrots (they need to be very thick) and cabbage. 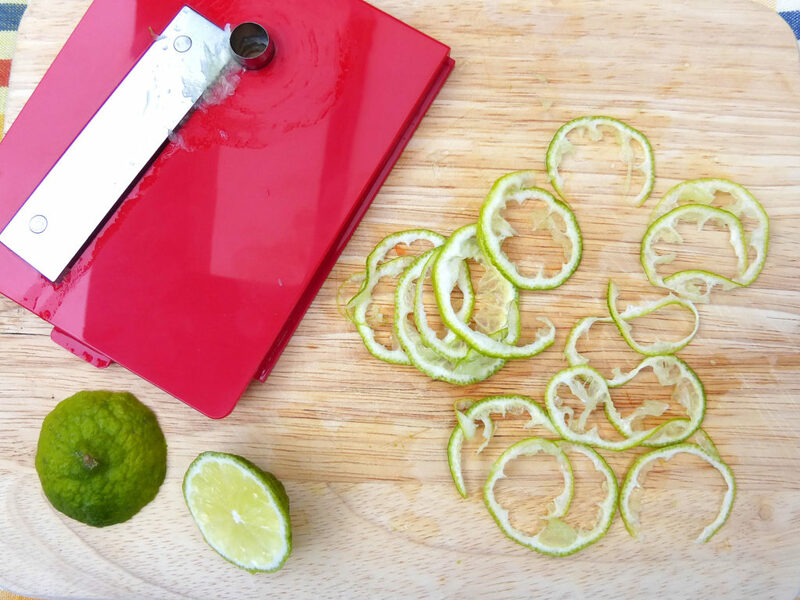 Although you can take the spiralizer apart to clean it, softer foods (such as limes) were tricky to clean off the blade, and left behind a bit of mess. However, there is a reason why certain foods are recommended more than others, and if you’re like me and choose to go against the grain, this is to be expected! The platform seems a little bit of a weird angle: it’s not really high enough to get a plate or bowl under, meaning that food can just drop off the end, and a little all over the place. So, there you have it. The burning question is, would I recommend buying one? While I’ve loved using it so far, and am genuinely excited to see what else I can come up, I also wonder if it is one of those gadgets I might quickly lose interest in, only for it to end up in the back of the cupboard. However, if you want a healthier alternative to pasta, eat loads of stir-fries and colourful salads, then absolutely – it will make your life a ton easier! For more information, take a look at OXO’s website. 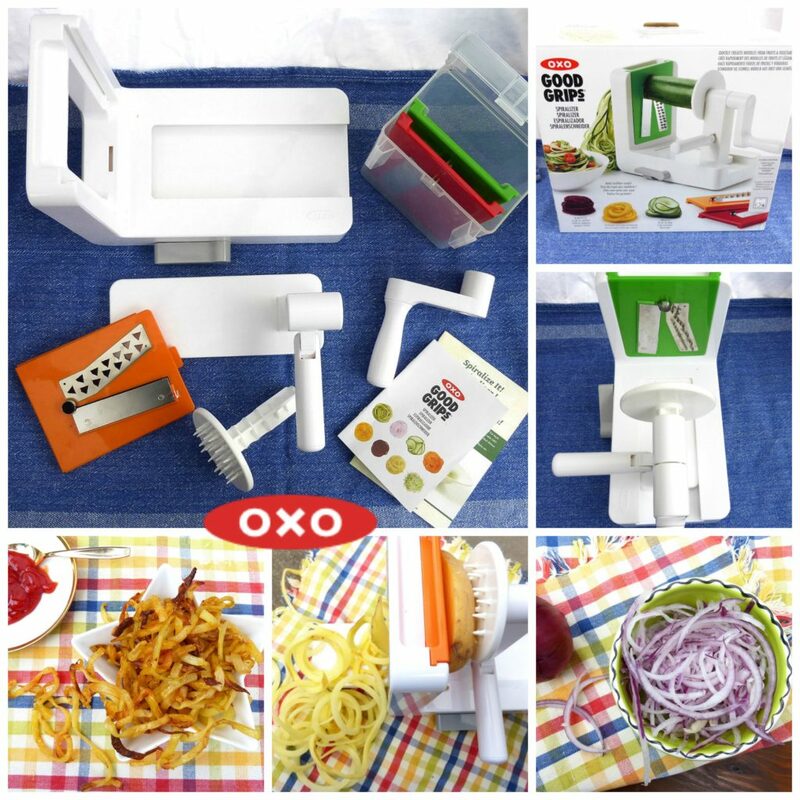 OXO also have a great online tutorial which offers you an in-depth look at the spiralizer, including how it works and what you can use it for. This OXO product was gifted to me for the purpose of providing an honest, balanced review; however, I did not receive any payment for writing this. In addition, I have not received payment from OXO for any of the links included in the review. They have been added for the sole purpose of making it easier for readers to locate the product, should they so wish. All views stated (as well as the photos) are my own and reflect my personal, unbiased opinion after using the product.